As always: CHECK water quality first... where, when in doubt, CHANGE WATER. Some salt/s can be of use. Hi Neale, how are you? I have a male guppy that I've owned for over a year. For the past 6 months he has been in a 2.5 gallon tank by himself, because he doesn't fit with the fish in my display tank (he attacks the honey gourami, the Rasboras attack him). I was trying to re-home the guppy but with no luck, so that's why he is still in the small tank. Because of the size of the tank, I do 40% weekly water changes. I have a small HOB filter and a non-adjustable heater that keeps the tank at 78 F.
So this past Thursday morning, the guppy wasn't eating properly; he kept spitting the food out, maybe eating just a little. Thursday night I did a water change. Friday morning he ate the same way and was mostly keeping to the bottom of the tank. I tested the water Friday; Ammonia and Nitrites 0, Nitrate 5ppm. Saturday morning he had a long white stringy poopy attached to him, longer than his body. He was swimming around slowly. I thought maybe he was constipated. I fed him a tiny bit of freeze dried brine shrimp that has Spirulina added to it, and he ate it. I also gave him a smashed pea, and he nibbled it. Afterwards he began to swim around actively that day and night. Now today, another white stringy poopy attached. I offered him a flake and a pea but he won't eat. He is swimming around slowly, and his breath looks a little labored. I don't know what to do for him! I started to read that the poop may be a sign of parasites, but he is in the tank alone, and I have not introduced anything new to his tank. Do you have any advice? <Do use Metronidazole; this should help. Used correctly won't harm your Guppies. Treat the tank, and ideally both tanks though usually such parasites affect weakened fish rather than everything indiscriminately. Hi again Neale. I have some questions now on the Metronidazole. I purchased the Seachem brand, which is a powder, and it says the measuring spoon that comes with it is about 100mg. I treated my tank the past two days, estimating 62.5mg for the 2.5 gal. tank. <I see. Do understand than 2.5 gallons likely won't provide good conditions. And poor conditions will make medication less effective. My guppy seems improved; no more stringy poop and he is starting to eat. I was planning a third and final dose tonight. My question is; I'm reading to fully eradicate the parasites, the fish should be fed the medicine. On WetWebMedia, I read the food should be soaked in a 1% solution. How do I make a 1% solution with a 100mg measuring spoon? I also read 4 oz. of food per 1/2 teaspoon of Metronidazole; will that work as well? Then like the article on WetWebMedia states, I'll soak for a few hours in the fridge; can I use flake or freeze dried food? Just one feeding is sufficient? Also, you recommended I treat my main tank as well, but the fish look and act healthy, so I haven't done this yet. I don't want to cross contaminate though so I'm considering treating my main tank, but would it be best to treat the water, feed them the treated food, or both? <Do read the Seachem site. It specifically states two ways to use their medication, either in the water or mixed with wet-frozen food paste. Both approaches look easy. Hello Neale; I hope this email finds you well. I am writing you again in regards to the use of Metronidazole. I used this medicine in my 2.5 gal tank for a guppy with internal parasites and he has improved (I wrote you earlier explaining I was trying to re-home the guppy because he is not compatible in my community tank; so for now, the 2.5 gal is the best I can do. I perform 50% water changes weekly and have scaled back feedings to once per day). You had recommended I treat my display tank as well, since I share equipment between the two tanks, so I treated the display tank only once. I have 1 Honey Gourami and 3 Corydoras in that tank (I re-homed my Harlequin Rasboras; my display tank is 10 gal. and through observation, I concluded the Rasboras need a longer tank to swim back and forth). Seven days after treatment, one of my peppered Corys is lethargic. I don't see any physical abnormalities. I have since performed two large water changes of about 40-50% a piece, rinsed the filter media (sponges), added a bubbler- would the extra oxygen be helpful?, and have scaled back feedings to once per day. The Cory has been lethargic for 5 days now. He was breathing shallow this morning but did eat a pellet- is that a good sign? <Catfish sometimes react badly to medications, particularly copper, but I don't think that's the issue here. One problem for Corydoras is that they're low-end tropical species, especially Peppered Corydoras which really are best kept around 18-22 C/64-72 F, which is much cooler than the average tropical aquarium. Couple this with the use of medication and what is rather a small aquarium, and you could simply be seeing respiratory distress. In other words, yes, adding a bubbler would help if it was placed at the bottom of the tank (bubblers work by drawing water from the bottom to the top, not by mixing air with water). Lowering the temperature, if possible, and increasing overall water turnover rate would also be useful. Corydoras are generally hardy fish, but inbreeding has meant that their quality varies, and sometimes they fail to thrive even in well-maintained aquaria. Occasionally, diseases such as Red Blotch Disease (which I've recently written about for FishChannel.com) can cause problems as well. 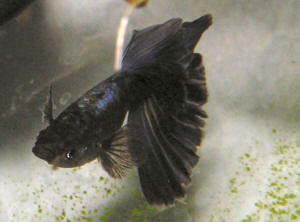 I wrote you in January about my Guppy, who showed signs of Hexamita. He was in a 2.5 gallon aquarium, and I explained to you how that was supposed to be a temporary tank until I could re-home him. I treated him with Metro for 3 days and he seemed to recover completely. so I thought it was safe to completely remove the poly-fiber and replace it with the bonded filter pad. It was after this switch my Guppy became ill with Hexamita; I don't know if there is a connection (at this point I had my Guppy for 1 year and 2 months). I also changed the filter media to the bonded filter pad on my display tank (which has a bio-wheel in the filter) and an Albino Corydoras died a week later; at the time my Nitrates had spiked (30 ppm), so I attributed the death to Nitrates (Ammonia and Nitrite 0). After treating the display tank with Metro for good measure, a Peppered Cory then died a week later. I could not figure out why the Peppered Cory passed (Ammonia and Nitrite still 0, Nitrates now 10 ppm). I added a bubbler to the display tank (which is 10 gallons). I have 2 Corys and 1 Honey Gourami in that tank. Since my issues began when I switched filter media, I recently returned to the poly-fiber (again, I don't know if there is a connection or not. Are you aware of any issues with Marineland bonded filter pads?). In my 2.5 gallon tank with the Guppy, I switched out half the filter media for the new, and a week later switched out the rest along with the usual weekly water change, which took place this past Wednesday. Sunday, my guppy did not come for his morning feeding right away, which is not normal. He did eat eventually but spent a large bulk of the day hiding. Monday he was slow to come out for food again, and once he did, he almost seemed senile. Like he didn't see the food and just wasn't with it, and once he finally found it, he struggled to grasp the flakes. He did eat though and I took the opportunity to observe him. I think I saw a slight reddish coloring near his gill but I'm not 100% sure. He seemed like he had a lack of energy and hid the rest of the day. I performed a water change and added some aquarium salt to the new water before adding it to the tank. That evening I put a fish net in his tank and slightly agitated it in the water, to see if i could get his attention to try feeding him, but he did not respond. So I put the wet fish net in a bucket I use strictly for the fish and let it sit there overnight. This morning my Guppy was dead : ( I took him out with the fish net and observed him to see if I could detect any abnormalities. That's when I noticed, on the outside of the net, there was a worm crawling- it was tan and thin, less than 1/2 an inch long, had many legs like a caterpillar, and a brown "nose". I did not see any worms in the tank. Given the history here, would you know what this worm is, and could it be connected to the Guppy dying? Any other ideas or helpful information you could impart? Re: (Guppy Stringy Poop) Peppered Corydoras, Other Factors? Hello, I am sorry to have to email, but I am not sure what course of action to take next. We bought 8 guppies (and some danios) 3 weeks ago and now have 3 left, but they seem to be suffering both hemorrhagic septicaemia and fungal infections/fin rot, the problem is the fungal/fin rot medication says I cannot use it with other medications, and since those problems started first I am already using this in the tank. We just moved into our first house so were able to buy a much better home for our platys and danios (housed in a 23 l Fluval edge that they outgrew, but which was perfect sized for our rented flat). We bought a 180 l Juwel Rio. We set up the Rio on 8 Dec 2012 (with cold water from hose) and left the heater to bring the water to room temp overnight and the filter to clear up the water before buying 6 plants to add the next day (2 spiral grasses, 3 Amazon swords and 1 Bacopa caroliniana [I think]) and adding 6 pieces of aquarium driftwood (from the LFS soaked for an hour). In the middle of the week I added another 3 plants (including another spiral grass and 1 elodea). At the weekend (tank 1 week running) we fetched the old tank and our fish from the parents (who had not changed the water in the 2 months they had it and at that point we learned we had lost the bully Danio) and added all the old substrate into the tank, added the old filter material to the 1 week-old Rio filter, moved the decorations and the old plants into the tank and then acclimatised our fish (4 female platies and now 3 zebra danios). Over the next week we kept an eye on our fish and all seemed well, so I went to the LFS to stock our Danio numbers back to 6+ to calm them down a bit and make them school/shoal. I chose 2 pearls and another leopard, golden and 1 longfinned zebra fish (although another sneaked into the bag). Whilst I was there my partner fancied some guppies so we ended up with 2 males and 6 females. At home we raised the temperature of the tank to 24 C to suit the guppies, acclimatised the fish and released them. Strangely the guppies and danios seemed to school together in 2 mixed groups, apart from the free longfinned zebra who was a loner (the one I had chosen was the bully of the tank, but also smaller than all our fish). The next morning he was schooling with the others though. New Year's eve we'd had the fish 10 days and after being unable to find the Danio I checked the health of the other fish and noticed one males tail looked a bit shorter, the noticed I couldn't see the 2nd male, and found him in perfect condition trapped by gravel that had moved under a decoration - I think he died from the stress of being trapped. I was concerned about the 2nd male but had guests so couldn't do anything. The next day I tried watching to see if he was being nipped by the danios but couldn't see any aggression, and as the day progressed I started to notice that the scales in front of his dorsal fin looked raised and he appeared to have fungus on his lips. Another 2 females appeared to have fungus on their lips, another seemed to be covered along the dorsal side from head to dorsal fin (not including fin or lips), and a fourth had a few spots of fungus. I scrubbed the old tank clean and started setting it up to use as a hospital tank but it cracked when half full, so as the shops were shut I decided to give these fish a 5 minute salt dip. First 3 the lightly affected females, then replaced with the male and heavily fungused female. The first 3 swam the entire time they were in the pan, whilst the male hardly moved and the bad female jumped out twice immediately. When back in the tank (now slightly salted with API aquarium salt) all seemed fine - the lip fungus was almost clear, the heavily fungused female looked normal, but the one who had only a few specks stopped swimming and eating and stayed 1 inch below the surface. She didn't eat the next day but went into labour, the first seemed to take her 30 min.s to get out completely, then she ate, then over the next few days she had the rest but didn't eat and kept hiding. Suddenly she disappeared but I never saw anything wrong with her. The males tail kept getting slowly worse although his scales got better so I added 'Love Fish Anti Fungus and Fin Rot' (only one stocked at LFS) to the tank, and slowly increased the salt level to the 1 tablespoon per 20 l.
Next another fish started getting what looked like creamy worms sticking out of her sides (maybe pus or raised scales) which then became red at the base after a few days looking like septicaemia in humans, her tail started to slowly rot and her side fin was slightly frayed where the creamy/red bit was. She gave birth during this time (again over several days) but died before having them all. At the weekend with no more visitors and the tank having been set up 4 weeks (fish with enough bacteria for 3 weeks, new fish for 2 weeks) and I decided it was time for a water change and thorough tank cleaning. I changed 30 %. 2 days later I cam home from work and a female who had been healthy at the morning check had only half a tail and all fins were frayed. Now the 2 healthiest females are showing symptoms. The first started getting the creamy/raised scale things, and has slowly been developing the red dots (including on her lips). They both looked like they had septicaemia, but one cleared up whilst the other got worse. She is now hiding, and her tails seems to be splitting along the rays in the centre and has a white ?fungus? speck on her tail, and she seems to not want to fight for food, although she tries. She has also just given birth. The female that had the cleared-up red dots and the one which had lots of fungus seem to be fine, but are both coming close to giving birth. Should I continue treating for fin rot/fungus or move onto anti-internal bacteria to treat the septicaemia [I can't do both at once :( ]. Are these just weak guppies from the store (all my fish and the new danios seem healthy), and if so, will their fry survive or will they also overcome by being genetically weak? They are growing fast, eating the flakes and are bravely teasing the danios. Could an issue be that the tropical fish flakes ran out and we moved onto some goldfish flakes the parents bought? Could the haemorrhaging be bruising from the danios/platys attacking the guppies: I haven't seen much inter-species aggression and the guppies seem fast enough to out-run the danios, but usually just school with them. Thanks for any help and sorry this is so long. Water quality (4 days after the 2nd 30 % water change in 1 week). <... the two above are toxic in any measurable quantity. Need to be 0.0.
and a few cherry shrimps. Ammonia & nitrites are zero, nitrates around 25ppm (London water). the bottom of the tank and goes through periods of being pretty lifeless. <Yes, this can happen. Difficult to pin down the precise problem. Stress from male attention is certainly one factor, and constant breeding can perhaps "wear out" females in a way that wouldn't happen in the wild. I separated her when I first noticed her behaviour into a little nursery net and treated the whole tank with ESHa 2000 (her eyes appeared a little large and I feared pop eye). I then gave her a 5 minute dip in some methyl blue and returned her to the big tank. Anything else I could be doing? Thanks for all your continued feedback, I am learning if somewhat slowly! Advice/suggestions all taken onboard with much eagerness. Just to let you know, the oddly behaving guppy delivered 32 baby fry this morning (hence the loss of colour and lack of eating). I've certainly learned that not all guppies are made the same! Behaviour is different with each individual. Hi, I have read all through your site about the guppies and learned several things I didn't know, but still didn't find the answer to my problem I'm having, so I'm hoping that you can help me or lead me in the right direction. Let me start off by giving you a little history on my tank back to about 3-4 weeks ago. Up until 3-4 weeks ago my tank had been up for a long time (about 7 months) and doing pretty good. It's a 10 gallon tank with heater, outside filter pump, light, hood, etc. Well, I got some new fish and had a breakout of a fungus infection so I immediately got a fungus clear medicine by Jungle and it cleared it up immediately. Then 2 days after that Ich broke out in my tank so I treated that with a different medicine. All together, most fish survived this process (I had 6 fish at the time) so I was pretty happy. Suddenly about 3 days after stopping treatment for everything since it was all cleared up, my fish started dying. (not the best idea I know, but when I was changing it I noticed it was blue from all the medicine) but I did keep some of the "muck" from the bottom gravel to help a little bit in the cycle and I also added a bacteria supplement. mom what could be wrong and we began to think it was our water as we have well water and have never had it tested so to be honest I have no idea what minerals and stuff could be in our water. So we went out and bought some water out of a machine at a grocery store. replaced gravel, ornaments, filter, everything, basically starting from scratch. So there is the background on my tank, now to my fish behavior. Starting after the one female had her babies, all the fish began hanging at the top of the water, not gasping or anything, just hanging out, but they had stopped eating, and still haven't eaten yet as of today and I have put in flake food, Spirulina, and algae chips. active and I can't figure out what's wrong. I also do not have a freshwater test kit but I do have a saltwater test kit and I have been using it hoping I could at least get a rough idea of my ammonia and nitrite levels. However the nitrate test is a fresh/salt water test, so I can trust that one. Before the 100% water switch my nitrates were 25, which I didn't think were good. Sorry for such a long email I am just hoping that you can help me and tell me what is wrong with my guppies. Oh yeah I forgot to mention that I have 10 fish as of right now, 5 adults (1 pregnant female) and 5 juveniles, and a few of them have been flashing (I think that's what it's called when they are scratching up against objects) for the past 2-3 days. Thanks for any help you can give me!